Whether you’re a seasoned cook or simply craving for an opportunity to learn to make something new, nothing beats a warm home cooked meal. 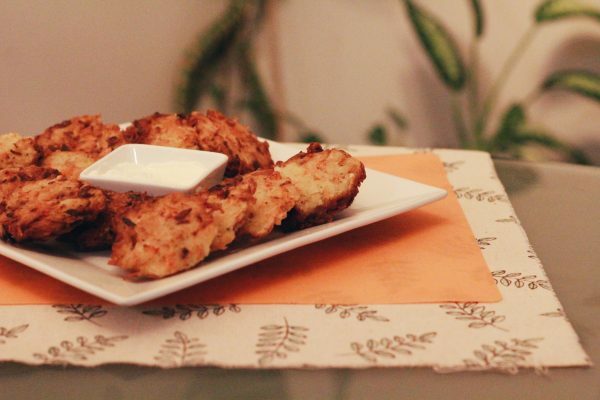 This recipe for potato and carrot latkes served with a simple apple sauce was created to complement student life. The ingredients to make these golden and crispy potato pancakes are budget-friendly and many can be found in the McMaster Students Union Food Collective Centre’s monthly Good Food Box. The recipe calls for about half an hour of your time over a mixing bowl and frying pan, making it a fair bargain for a wholesome dish to enjoy over a sit-down meal or on the go. Wiseman is the creative mind behind Dundurn Market’s prepared meals and helped evolve Green Bar into a full vegan restaurant. The local Hamiltonian has been cooking up hearty meals for 20 years and has a passion for healthy eating, sustainable food practices and recipe creation. Wiseman is currently packing her bags for a trip to Bali, Indonesia where she will be studying raw, vegan cuisine and chocolate. 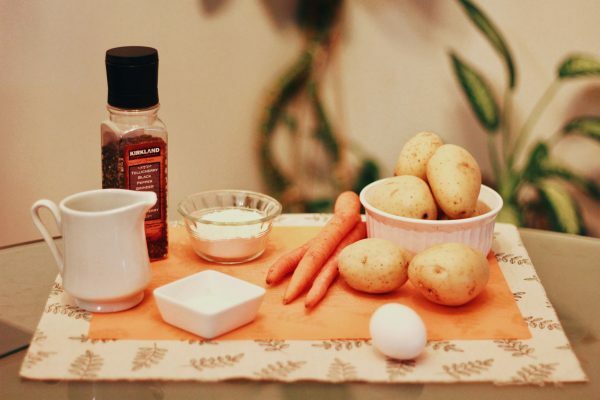 Grate the potatoes and carrots using a hand grater or a food processor using the largest holes to get thick strands. Place the grated vegetables together with the sliced green onion into a large bowl. Allow the mixture to stand for a few minutes. Scoop out handfuls of the mixture and squeeze over a small bowl to remove excess moisture. Transfer to another bowl and repeat with the remaining veggies. Add the egg, flour, salt and pepper to the veggie mixture. 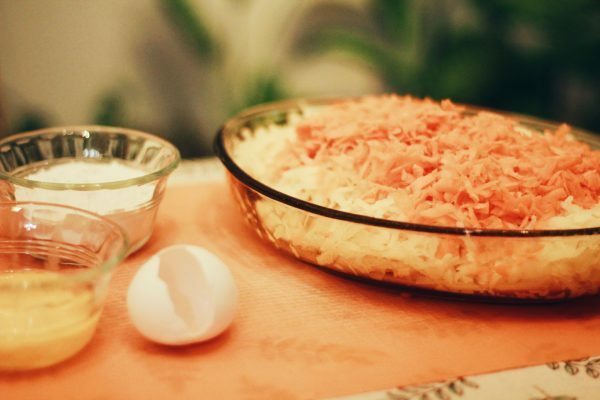 Drain the liquid from the small bowl; you will find a layer of potato starch on the bottom. Add this starch to the veggies as well. Stir everything together. Heat a large frying pan (preferably cast iron) over medium heat. Cover the bottom of the pan with ¼ cm oil. Pack a ¼ cup measuring cup with the veggie mixture and form this into a small cake in your hand; place in the hot oil. 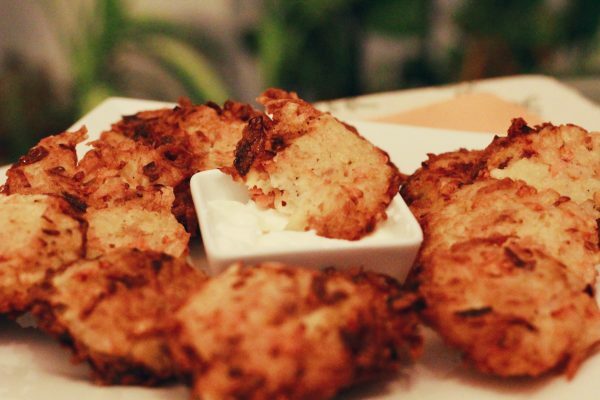 Repeat until the pan is full, leaving space around each latke for even cooking. Cook several minutes until golden brown on one side. Flip and cook until done on the second side. Remove from pan and drain on paper towels. Repeat until all the veggie mixture is cooked. Roughly dice the apples. Place in a small pot along with the water and sugar. Cook on medium heat with the lid on for 25 to 30 minutes, until the apples are very soft. Remove from heat and blend with a potato masher, food processor or immersion blender. 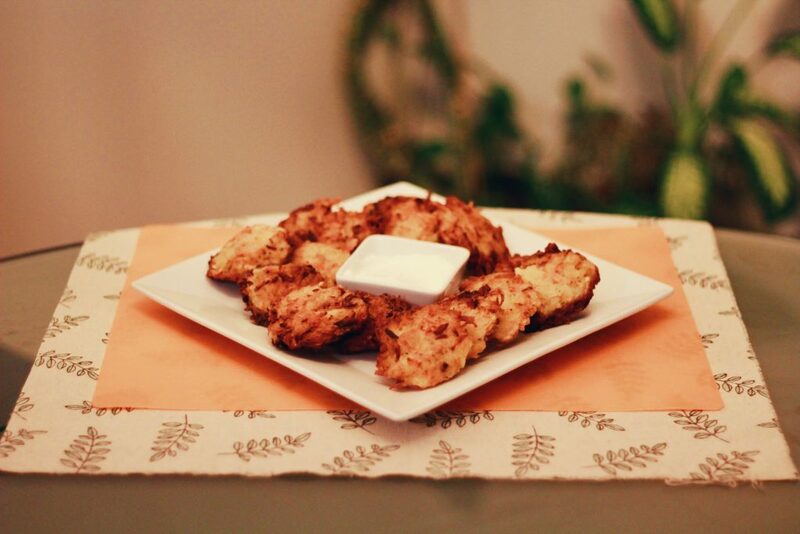 Serve the latkes with the freshly made apple sauce and sour cream or Greek yogurt. Garnish with more sliced green onions or fresh thyme leaves.